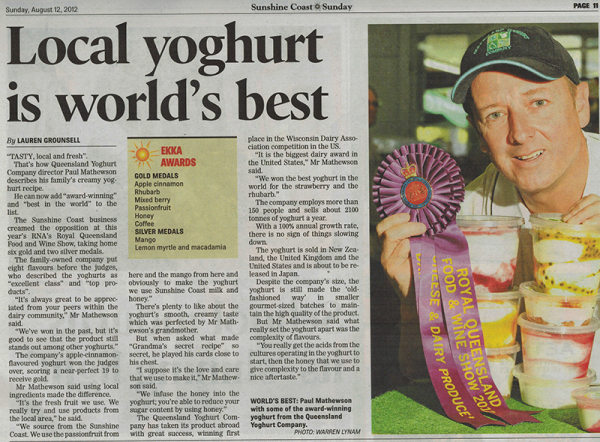 Queensland Yoghurt’s Apple and Cinnamon Yoghurt, which scored a near perfect 19 to receive gold medal was also awarded ‘Champion Dairy Dessert or Yoghurt of Show’ as well as scooping the prestigious ‘Champion Queensland Cheese or Dairy Dessert or Yoghurt of Show’ which was selected from all Gold medal winning entries. Other Gold medals went to our Rhubarb, Mixed Berry, Passionfruit, Honey and Coffee. Silver was awarded to Mango, Raspberry and lemon Myrtle & Macadamia.